HOUSING MINISTER EOGHAN Murphy today announced the opening of a new state lender that aims to deliver 7,500 homes within five years. 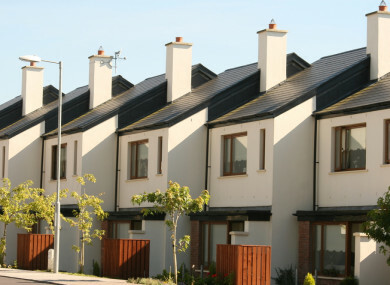 Home Building Finance Ireland has been given €750 million to lend to small and medium size builders and developers, many of whom are facing difficulties in getting loans from the establishment banks. Applications for more than €35 million or for less than 10 units will not be considered. Sites must have planning permission or have a lodged planning application and the rates on offer are industry standard of between 5%-8%, according to Finance Minister Paschal Donohoe. Speaking at the launch today, Michael Broderick, HBFI Project Lead, explained the new State lender is focusing on the first-time buyers market. “I am not saying we would never fund a build-to-let but certainly that won’t be our target and won’t be our objective in the early days,” he said. The lender is working off a basic build cost of 200,000 per unit. However, Broderick said they are also working on the premise that the €750 million will be recycled twice within a five-year period. “We see project delivery with 24 months from inception and sale,” he said, adding that any money generated will be folded back into the project. Speaking about any limitations the lender might have, “capital is not one of them”, he said, adding that there is an option of drawing down more funds from the market. The finance minister said the reason this body is needed is because there are a number of market failures happening in the housing sector at the moment. From engagement with builders, Donohoe said while banks are lending, there is evidence they are only lending to a certain size development in urban centres, and smaller project builds are being left behind. He said that outside there is market opportunities for lending that is not currently being met. In areas where this is apparent, where developers and builders are below a certain level, “lenders are not meeting the housing need,” said Donohoe. When asked why the State would take on a loan that the banks have deemed to risky, the finance ministers said a full analysis of the projects will be carried out, like any other lender, stating that they are not going to be “taking on risk that others will not”. Why has it taken so long for such a State lender to be established? Donohoe said the legislation had to be drafted and passed through the Houses of the Oireachtas, and due to the “busy” legislative schedule last year, it took time to get the new laws through. He said the government also had to ensure that it was not breaking any of the EU Commission rules on State aid. There are no easy solutions to the housing crisis but this targeted measure in the creation of HBFI will have a real and tangible impact in addressing one of the underlying problems in the market today. It will build on the progress already made in boosting supply. It is a very significant step and restores another once broken part of our housing sector in a sustainable way. Email “New State lender to give cash to small developers to build homes for first-time buyers ”. Feedback on “New State lender to give cash to small developers to build homes for first-time buyers ”.